MYRTLE BEACH, SC (WMBF) - Want to get someone's attention? Yell "Shark!" Just the word gets people to listen. 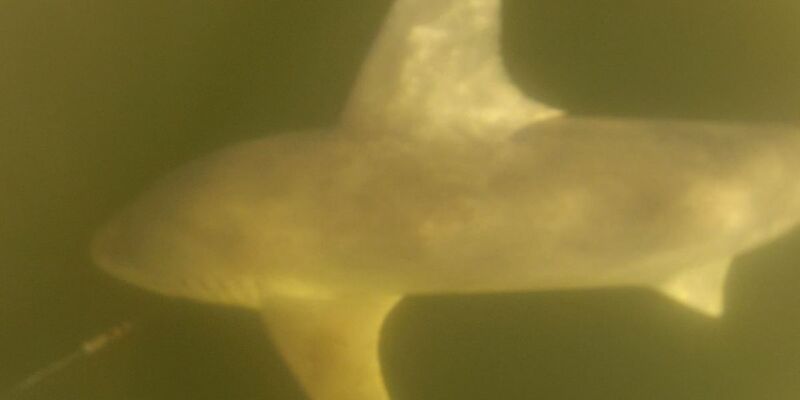 From Jaws, to Shark Week to our own coverage of the occasional shark bite along Grand Strand beaches, these ocean predators get a lot of press, despite how little we know about them. Yet, much of what we're learning is coming from research going on right here off the Carolina coast. Considering this is a place where people come to find peace and relaxation, a mecca for recreation, what lies beneath the surface is still a mystery. Oh yes, we know what's there. We just don't know when or where they're going to show up. But for swimmers, surfers and boaters, they are the sum of all fears. The single biggest threat whenever you choose the ocean as a playground. Professor Dan Abel teaches Marine Sciences at Coastal Carolina University. He is known as one of the best on the planet. When Anchor David Klugh caught up with him, he and his lab students were dissecting a black tip shark. Students both inside and outside the Marine Science program line up for a chance to take one of his shark courses. "This is a pretty common species to catch in South Carolina and Winyah Bay," says Abel. "That's where we got this guy." Abel and his students have been opening up new insights into what motivates these creatures, why they do or don't attack humans, what they prefer to eat, and why they return to the same place every year to breed and feed. These are things you can't do in the classroom. You have to get out on the water catch sharks. A crew of undergraduate and graduate students set their long lines out to sea, and within 30 minutes had no fewer than three sharks on the line. Shark research takes sharks, a lot of sharks. Every week, undergraduate and graduate students are out in Winyah Bay, and up and down the coast of South Carolina, catching these magnificent creatures, measuring, tagging, sampling and getting closer and closer every day to cracking the code on what makes these fish tick. Dan Abel's graduate research associate, Bryan Keller, is also making the study of sharks his life's work. His most recent research has proven that sharks are social animals, not mindless, independent contractors sneaking up on the next meal. "If people don't start to realize that sharks aren't man-eaters," Bryan insists, "…if they can believe that from my thesis that they are capable of these complex social behaviors, that's the hope, that people stop putting such a stigma on sharks." While CCU's shark research is proving important in understanding shark behavior and their value to the ocean eco-system, it has not gained the kind of attention organizations like Ocearch has. This multi-million dollar program of tagging and tracking great whites up and down the East Coast has gained a lot of attention, and so has the research into the superstars of the shark species. It's the first group to open its research and tracking to public view through YouTube videos and real time tracking of the sharks it has tagged. The Ocearch team is taking a break after two years of exhaustive research up and down the East Coast, including the constant monitoring of Mary Lee, the first Great White to be tagged and tracked by the organization. Mary Lee is also one of the Great Whites that spends a good chunk of her time cruising the Carolina coast. Chris Fischer, the founding chairman of Ocearch, says, "The appeal from the tracking and open sourcing everything to the public is far beyond anything we expected. Mary Lee has made it clear that Cape Cod is connected closely to the southeastern United States. The conversation around sharks has shifted from one of fear to one of appreciation and understanding." Fischer, like the men and women at CCU, is desperately trying to fill the gaps in data that can be used to effect policy worldwide. The end goal is to stop the gill netting and long line fishing in areas sensitive to mating, spawning and feeding. The spotlight alone will not stop the killing of sharks at a rate of 100 million a year. That real data, and the scientists and students gathering it, are critical. That's where another CCU grad comes into the picture. Some of the most promising shark researchers in the world are coming out of the university. One of their graduates is already making a huge impact on the effort to save the shark from the slaughter. His research on rare-earth magnets could one day prevent sharks from biting on hooks and swimming into nets not intended for them. In fact, what he's discovered could also keep sharks from accidentally taking a bite out of you. Craig O'Connell did his undergrad work at CCU and is now finishing his doctorate at the University of Massachusetts. That's where we pulled him away from the labs. O'Connell chose CCU based on reputation and the independence it gave students to pursue the kind of shark research they felt could make a difference. O'Connell's magnet research is a prime example. Because sharks are hyper-sensitive to magnetic fields, O'Connell is using that trait to save both the shark, and the rest of us from shark bites. "We believe that we can actually either magnetize a fishing hook or put magnets along a beach net and deter sharks from beaches or deter sharks from fishing hooks, and therefore reduce this mortality," O'Connell says. O'Connell has also been studying the Great Whites that swarm the northeast coast, particularly around Cape Cod. His interest there is about the lack of shark attacks on humans, given the number of Great Whites close to shore on any given summer day. "It makes you realize if these sharks were really seeking out humans for prey, there would be an attack every minute of the day," he says. "They're always there. And so, we're not on their menu." The school that launched Craig O'Connell's career in science is still producing new shark data every day. "More and more students are coming to Coastal Carolina, and their goal is to dispel the myth that sharks are mindless people eaters," says Dr. Dan Abel. There are really two goals in all the research going on at CCU and around the world when it comes to sharks: proving their value to the ocean eco-system, and proving they are not in the water to make lunch of your leg. But make no mistake, the ocean can be a dangerous place. "You should be afraid that we dump so much into that ocean that you could pick up some sort of throat infection or worse because of the bacteria in the water," concedes Abel. "You should be afraid of the jet skis that are zipping back and forth. The sharks, eh, not so much." Our fascination with sharks will no doubt keep careers like Bryan Kellers' swimming along for decades. "I think a lot of shark scientists enjoy studying sharks because you know, they're the canary in the mine," Kellers says. "By keeping them healthy, they're keeping the environment healthy. Hopefully I can have a little piece of that pie." And every shark he pulls from Winyah Bay or the waters off Myrtle Beach will give all of us a better understanding of why our own survival could depend on theirs. If you want to track the sharks Ocearch has tagged, including Mary Lee, click here.